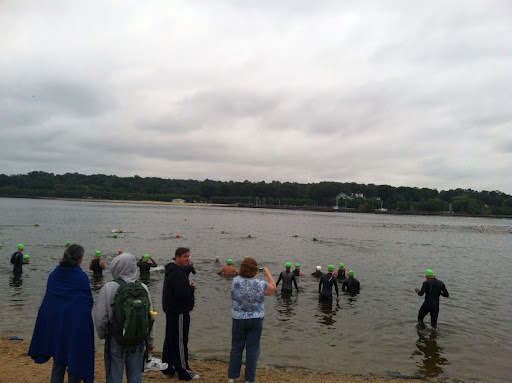 This past weekend was the 16th annual running of the Long Island Gold Coast Triathlon. 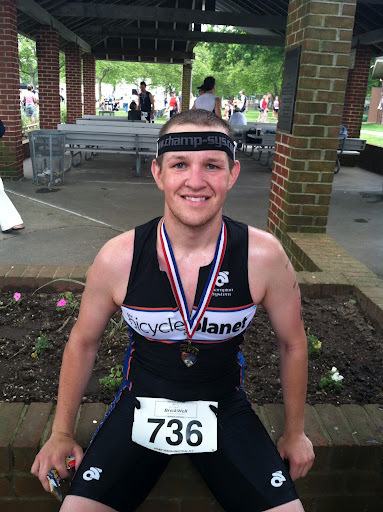 The race was your run of the mill sprint distance triathlon; half mile swim, 11.5 mile bike, and a 3 mile run. The race started at a nice park in Port Washington. I woke up and had my new race breakfast of a toasted bagel with peanut butter, picked up an iced coffee on the way, and headed over to the race. The swim saw supposed to be a half mile clockwise path parallel with the shore. There must have been a problem with the buoys because most of them never left the shore. Instead, lifeguards on kayaks marked out the course. 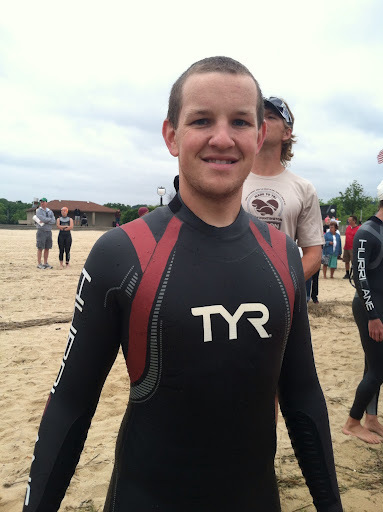 It was practically impossible to sight the course, but somehow, I was able to stay on course better in this race than any other I had swam ever before. Having seven waves, really thinned out the amount of athletes going off in each wave, and opened up a lot of open space to swim. As I was waiting for my swim wave to start, I was able to watch the other waves start, but was unable to hear anything the race director was saying about the direction or markings of the course. I instead decided to watch the other waves and try as best as I could to do whatever they did. I must say without buoys in the water it was very difficult to sight this course, but with the extra space around me in the water, it made the whole experience very nice. 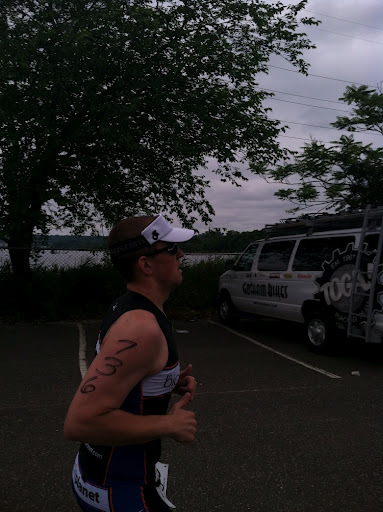 Once out of the water, I jogged the hundred or so meters up the beach to the transition area. Quickly rolled on a pair of socks, clipped on my race number, threw my sunglasses on, and buckled up my helmet and was off to start the bike leg of the race. Here’s where the race got a little messy. Remember my concern earlier with being in the last wave, yeah I had every right to be concerned. The mount line was super crowded with a number of people, some of whom were in my wave, but others who appeared as if they had never ever ridden a bike before. I ran past most of them looking for some open territory to mount my bike. Even as I did this, I was almost run into by at least two or three people poorly mounting their rides. The bike course was two loops on a 5.75 mile course. Again having been in the last wave, as I entered my first loop there was such a crowd of people. I felt like I was weaving in and out of cyclists trying to avoid both oncoming cyclists and cyclists going in my same direction. It was a disaster, but I made it out alive with a fast bike split and ready to get off the bike into T2 and head onto the run. Let me just say that I have nothing against beginner triathletes as I was in many of their shoes no more than a year ago. I just think that the race was very poorly organized and having been run fifteen years previously, it could have and should have been better. The run course was actually a pretty fun course to run. It started with a one mile loop out and back along the bike course, ran past transition and then had a two mile loop out and back along the beach. I was having some hip pain in the days before the race, so I told myself I was not going to push it on the run, and just give it whatever my body and my hip could comfortably handle. I guess with all of my swimming and biking, my hip was given ample time to loosen up and stretch out. I got onto the run course feeling great and was able to push pretty hard. I purposely didn’t bring my Garmin because I didn’t want to be upset if my mile pace was slow. I didn’t know what my pace was, but I felt like I was moving at a pretty good clip. Again having started last in the water, I was able to pass quite a few people on the run. I crossed the line faster than I ever had in a sprint before, super pumped. My run has significantly improved since last year. I still feel there is room for improvement in all aspects of my game, but I am definitely pleased with where I am right now. I was quite tired after the race, but as usual had a smile on my face.